I know, I know: I've worn this hat for the entire month. I can't help it! It just seems to make every outfit that much better; that much more put together. 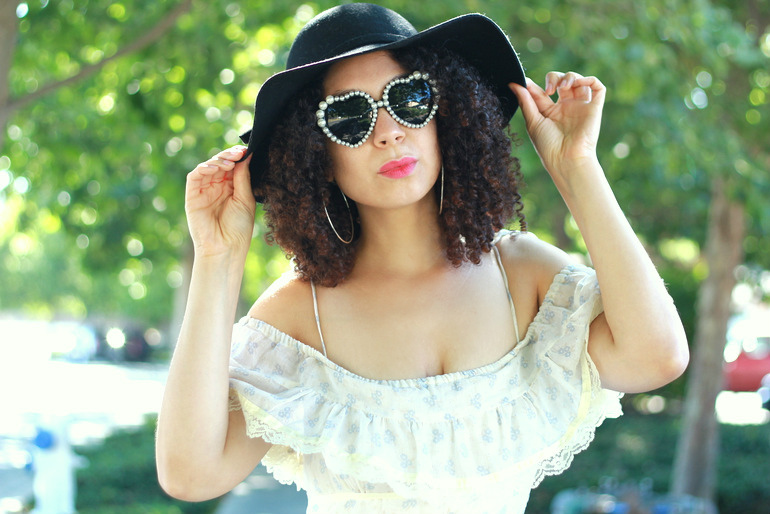 My newest obsession (other than this hat) has been Gunne Sax dresses. (I'm sure that my other obsession -The Little House on the Prairie- somewhat influences the outfit seen above.) How did I not know about these dresses? They are everything that the little girl in me desires when getting dressed: whimsical, playful, and borderline dress-up costume. But, you know, still acceptable for church/wandering prairie fields/grocery shopping (but more Trader Joe's than Whole Foods). The fact that they are now perfectly vintage (and that my "back yard" was their birthing ground), and that one must dig around at their local thrift/vintage store to find one makes them even more tantalizing. I must admit: the desire to forgo the likes of Zara/H&M, etc, and simply shop vintage and eBay is overwhelming....But we'll see. Love this dress! Your hat and sunnies add a stylish touch. I actually don't shop H&M much anymore, but I do like to shop Zara when I get that chance, which isn't very often anyway. But I like "vintage" look, luv. Amber! You turned into me for a second! I don't own anything like this, myself, but I wear a lot of this kind of thing in my head! Haha I guess we have similar inner children. It looks absolutely lovely on you. Love that dress, so pretty and perfect for the summer! This dress is beautiful! I agree with you, once I started shopping for vintage clothing going to the stores I used to just didn't feel the same any more. Especially since everything out now is vintage inspired anyway.